Space is often referred to as the final frontier, but this fall, it will serve as a launch pad for future educators being groomed at the University of Houston-Downtown (UHD). Thanks to a collaboration with NASA's Johnson Space Center Office of Education and astronaut Joseph M. (Joe) Acaba, UHD Urban Education students will look to the stars for inspiration and insights as they learn how to effectively teach science, technology, engineering and mathematics (STEM) subjects. During the fall semester, students enrolled in UHD's Science Methods course—aimed at preparing teachers to instruct STEM subjects with proficiency and confidence—will interact with Acaba while he is aboard the International Space Station (ISS). Students will email classroom experiments to Acaba. He will select specific experiments to conduct on the space station and send video feedback to the students. These cosmic conversations between students and Acaba will lead to an ISS In-Flight Education Downlink hosted at UHD during the spring 2018 semester. During the Downlink, Acaba will communicate from the ISS (via satellite link) to students at 9 a.m., Feb. 13 in the UHD Welcome Center's Tour Room. Additional NASA exhibits, educational displays and speakers will accompany this event. UHD is the only Texas institution selected to host a Downlink in 2018. "It's the experience of a lifetime," said Dr. Franklin Allaire, assistant professor of science education. "To interact with an astronaut who is aboard the ISS is an incredible event on its own. In terms of science, this project makes it very real for our students. They will go through the scientific process of creating an experiment, running it and refining it. Then they'll receive feedback from a scientist, who is also a former teacher, and happens to be an astronaut in space. It's definitely exciting and will elevate their own educational experiences and future plans as classroom teachers." Three classes of Urban Education students will participate in this project. In addition to Allaire, classes will be taught by adjunct lecturers Xandra Williams-Earlie and Dr. Celestin Ntemngwa. Students will submit experiments in October, November and December. They also will submit questions for Acaba by early February 2018. He will address selected queries during the live Downlink event. Acaba is the first person of Puerto Rican heritage to serve as an astronaut. An educator and hydrogeologist, Acaba served as the Mission Specialist Educator with the crew of STS-119, which traveled to the ISS in 2009. He returned to the station in 2012 as a crew member with Expedition 31-32. His upcoming journey to ISS—as part of Expedition 53-54—is scheduled to launch in September. Longtime friend UHD President Dr. Juan Sánchez Muñoz will be in attendance when Acaba and the crew of Expedition 53-54 launch in Kazakhstan. 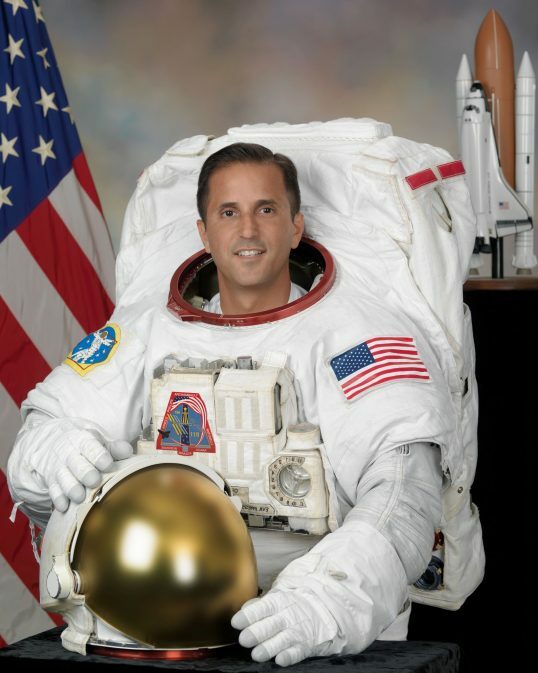 "Working with an esteemed educator and astronaut, such as Joe Acaba is an honor for our institution, and for me personally, having known him for more than 20 years," Muñoz said. "His interactions with the UHD faculty and its Urban Education students will further inspire their careers as teachers, and provide them with invaluable insights and world-class pedagogy that they will then impart in their respective classrooms." Joining Dr. Muñoz for the liftoff will be UHD College of Sciences and Technology Dean Dr. Akif Uzman. "It's a rare opportunity to witness a launch, so I am excited to be a part of this journey," Uzman said. "I've been following space flight since the Mercury days, so this is will be a very special moment for me. Upon my return, I am going to have discussions with NASA to establish further communications with ISS or to receive data collected in space that can be used for our classes or research." A UHD delegation recently visited NASA's Johnson Space Center to discuss the project and tour Mission Control and the Virtual Reality Laboratory. UHD visitors included Allaire, Ntemngwa, Urban Education Department Chair Dr. Ron Beebe, and John Lane, director of Technology Learning Services. Also on hand was College of Public Service Interim Dean Dr. Leigh Van Horn, who applauds the partnership and project with NASA. "This partnership with NASA and the International Space Station will engage our Urban Education teacher candidates in ongoing scientific inquiry and reflection with astronaut and educator Joe Acaba," Van Horn said. "We are grateful to UHD President Dr. Juan Sánchez Muñoz for initiating contact with Joe Acaba, NASA and ISS—certainly the most distant community partners for UHD's College of Public Service!"